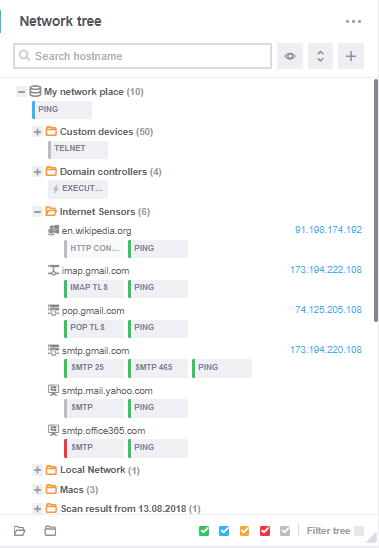 The Network tree is the main management widget. Here, the hierarchy of monitoring objects is displayed. Groups and devices serve as nodes in the tree. Sensors and actions assigned to each node are displayed below it. Devices correspond to actual network devices that can be monitored. Each device has a number of attributes, or parameters: address, network name, OS, etc. The easiest way to fill the tree with devices is to scan the network. You can also add devices manually using the Network tree context menu or the + button at the top of the widget. Groups allow to build a hierarchical structure that will lead to a more effective monitoring scenario. They can include both devices and other groups. The system provides an ability to import the existing Active Directory structure. More information can be found in the Adding scan tasks section.